1-23-10: Playing at the science museum. Brendan had such a great time running after the ball once it fell down off the stream of air. 1-26-10: Riding on the truck mover at Adventure Park with friend Isaac. 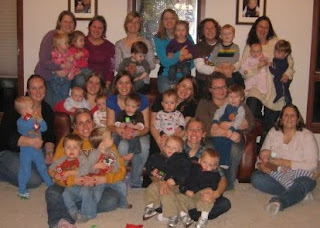 1-26-10: Our wonderful, huge playgroup. Up to 16 mommies!!! Hello everyone and hello February! We have been busy around here at the Casa de Lindberg. There was a trip to the Science Museum on the 23rd of January, Adventure Park on Tuesday the 26th and Playgroup that same night, then this past weekend a "Girl's Weekend Away Scrapbooking Retreat" with my mommy friends and finally another trip to play at Adventure Park. Whew...here are some pictures of our adventures.